At African Conservation Experience we are long-term supporters of Care for Wild Africa Rhino Sanctuary, a project at one of the world’s largest rhino orphanages that is committed to rehabilitating the rhinos orphaned by poaching so that they can be successfully released back into their natural environment. Whilst we try to convey how it looks and feels to head out to Africa and volunteer at the centre, hearing it first hand from somebody who we have helped to travel and work at the project can be extremely insightful. This is Louis Grittani’s story, entitled “The Call of the Rhinos”. In this abridged version of his experience he explains how he became aware of the Care for Wild Africa Rhino Sanctuary rehabilitation centre, how he made the decision to travel, and his eventful and rewarding experience out in Africa. If you would like to read his full story, please contact us. It all started with an unknown television show. It was the last Saturday in April 2016 and while flipping through the menu of television programs, the description of a travel show caught my eye. It was about rescuing rhinoceroses from extinction. I thought to myself “oh, that’s interesting”, considering I didn’t know rhinos were close to extinction. I was only able to watch the last 15 minutes of this travel program which featured the world’s largest rhino rehabilitation centre (Care for Wild Africa Rhino Sanctuary – CFWA). I was in awe of the infectious passion of its founder, Petronel Nieuwoudt, and that of her staff for the amazing work they do, which is to rescue orphaned rhinos whose mothers had been brutally poached (“poached” is simply a polite word meaning “killed illegally”). Immediately after watching the last half of this travel show, I visited Care for Wild Africa Rhino Sanctuary’s website, read it in its entirety, and watched some videos posted by past volunteers as well as other videos related to rhino poaching. I was so moved by what I had read and seen that I knew right then where I would be travelling to next. That afternoon, I wrote an email message to African Conservation Experience, who had been mentioned in the show, asking several questions about volunteering at CFWA. They promptly answered my questions. 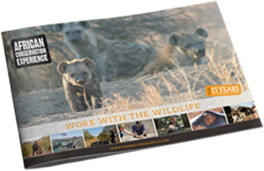 After a telephone interview with Ellie from the African Conservation Experience, an application form was sent to me to complete. During almost every lunch hour at work and every weekend at home, I obsessively scoured the internet for websites, articles and videos, looking to learn as much as I possibly could about CFWA and the issue of rhino poaching. The more I read and the more I viewed, the more impressed I became with CFWA. At the same time, though, I became more upset imagining the horrific scenes the young rhinos must have witnessed as they cruelly became orphans. With these mixed emotions, I was convinced I had made the right decision to volunteer. This trip was not only something I wanted to do, but it was something I felt I had to do. And so, on the evening of October 2, 2016, I boarded an overnight flight from Toronto, Canada to Munich, Germany, where I caught another overnight flight to Johannesburg, South Africa. After unpacking and settling into our quarters, we all took the opportunity to walk around the property together, seeing some of the animals that we would be caring for, and began working that evening with the preparation and feeding of the baby rhinos. What an experience that was! Bottle-feeding baby rhinos was simply amazing. Looking into their eyes, I saw their beautiful souls each and every time I fed them. “And I get to do this every day for two weeks”, I thought to myself. To this day, I still believe it was a privilege and honour to feed the rhinos! Actually, it was a privilege and honour to be entrusted to care for all the animals there, both big and small, both approachable and dangerous. But the rhinos were undoubtedly the main attraction and it didn’t matter if they were babies, adolescents or adult rhinos. After all, they’re the principal reason why volunteers are attracted to Care for Wild Africa Rhino Sanctuary. I’m not sure there is a ‘typical’ day at CFWA, but my days usually started around 6:00 am (sometimes sooner; it depended on when Tuscan, the resident lion, provided his morning wakeup call) and we finished working around 8:00 at night. In between, there would be formulas to prepare and administer, dry feeds to prepare and distribute, a lot of cleaning up (our own preparatory mess and the rhinos’ messes), a lot of physical work, some meetings, a bit of down-time and a lot of laughs and smiles, all while forming incredible friendships, bonds and memories. The chemistry between all the volunteers was natural and instantaneous. Sitting around the occasional bonfire at night after a hard day’s work only strengthened the camaraderie among the volunteers and the staff. It didn’t matter how tired we were at the end of the day, all of us volunteers were ready and willing to do it all again the next day. Now that I’m back home and after having let a bit of time pass, I’m ready to do more. I think it’s incumbent upon all African Conservation Experience volunteers to become ambassadors / spokespeople for the species we care about. Although we cannot fight every injustice in the world, we should stand up for at least one cause. For me, it’s animal rights and rhinos. Never before have I been so passionate about an issue. Whenever I talk about my trip or do anything related to it (like writing this article, for instance), I cannot help but get emotional about it. The rhinos have a hold on me. They are constantly in my mind and in my heart; they inspire me. Rhinoceroses must not become extinct in the wild; some have estimated this eventuality could occur in as little as 10-20 years! Instead, they must once again thrive and grow in numbers to a more sustainable population, well above today’s level. Their extinction, if it were to happen, would be a tragedy and a very sad commentary on humanity. It’s bad enough that they’re already endangered, but they are becoming more endangered by the day because of greed and misplaced beliefs. A change in mindset, spurred by information, must take hold. On a larger scale, I’m looking into the possibility of starting a Canadian charity that will help fund Care for Wild Africa Rhino Sanctuary, and possibly other sanctuaries as well. It will not be easy to accomplish. I have to find other like-minded individuals who share the same passion as me to save these wonderful animals and who are selflessly willing to invest the time and effort to make it happen. In a recent telephone conversation I had with a founder of the US-based charity Baby Rhino Rescue, Helena, who I had the pleasure of meeting while volunteering, poetically said to me “the rhinos are calling you”. I believe she’s right. I heard their call while watching television that fateful afternoon in April last year, and I’ve been hearing it get louder ever since. If Louis’ story has inspired you to learn about Care for Wild Africa Rhino Sanctuary, or you would like to discover more about how you can work with rhinos in Africa, you can follow the links below for more information. Raw Travel will premiere a new episode called ‘Amazing Animals’ in the weekend of July 1st-2nd 2017, in which you can see more of CFWA. Here is the info about where and when to watch this on US TV.